Hi, I'm Mary, I'm here to ask for your help in the fourth year of the quilt drive for Siblings Together. In the UK there are approximately 40,000 children in care now who are living separated from brothers and sisters who are also in care, and a further 4,000 children entering care and separated from siblings each year. Siblings Together provides opportunities for planned, enjoyable, creative and high quality sibling contact, for children living in different care arrangements. One of the children said in their feedback “and my blanket/quilt is so warm and keeps me safe”. I'm not aware of any research that proves that giving a child a quilt improves their chances in life but I don't doubt that it will help them feel valued and loved and that has to be a good thing. 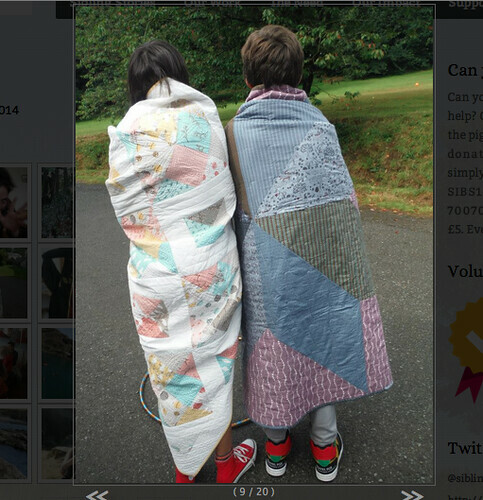 Last year a group of us got together and put a call out on IG and Flickr for quilt blocks for Siblings Together. 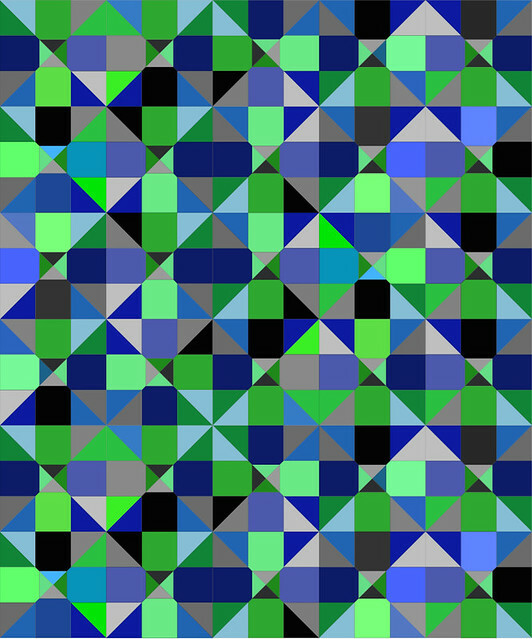 We received 211 blocks and used every single one of them making 3 quilts for the charity. We're doing the same again this year, but we'd love to make more than 3 quilts. 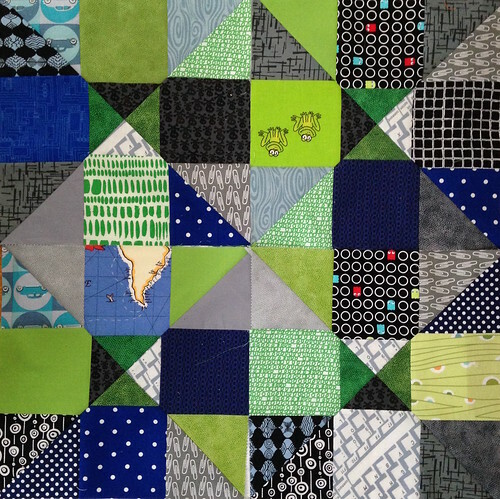 The finished block needs to be trimmed down to 13" square, please use green, blue, grey and black masculine prints so that the quilts are suitable for teenage boys. We would really appreciate your support and help with this, so please get stitching, spread the word on twitter, IG (share photos using #siblingstogetherhsh), your blog, Facebook, in your quilting group etc. Any offers of backing and or binding fabric will also be gratefully received. Of course if you want to make a whole quilt yourself, then please do, the details for donation are in the flickr group. Alternatively if you're interested in joining a Siblings Together bee please leave a comment below (with contact email) or in the flickr group and we will be in touch. Thank you in anticipation of your help. I will post updates on IG, in the flickr group and on my blog. Oh lordy I got to the second paragraph this year without crying. The only time in my life I really wish I could sew quilts. Get sewing quilters! If you can't sew, are you able to donate any materials, as requested in Mary's post? Every little helps. This is my sister and her only connection to quilting is me. She is more of a cheerleader for the cause than an actual participant!!! Ps I tried to comment along the same lines just a few mins ago so if the other pops out the ether you are not seeing double!! 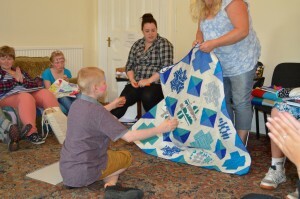 My quilt group Mowbray Quilters in North Yorks made 10 quilts last year and will be aiming for as many this year. It is such a great project to be involved with. You can see the quilts we made on our blog. 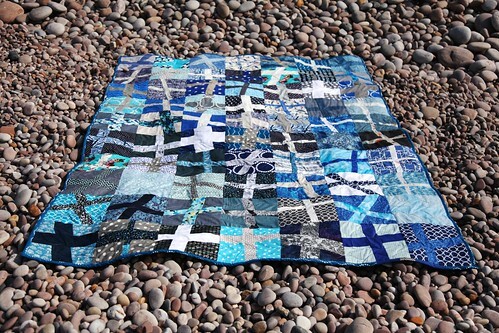 I actually grew up in care so would not only be willing to contribute a little something be that blocks or finished quilts (I think I'd be able to get a little group of ladies together for a Bristol based 'Bee') but I'd also be interested in a little further info regarding getting involved / volunteering in some way. My contact email is stokescroftstitching(at)gmail(dot)com. Great block choice, Mary :) If you need any more, just let me know! I hope we reach our target! A great post Mary. If any of the ladies expressing an interest would like to join in with another group quilt I'd be happy to coordinate it. 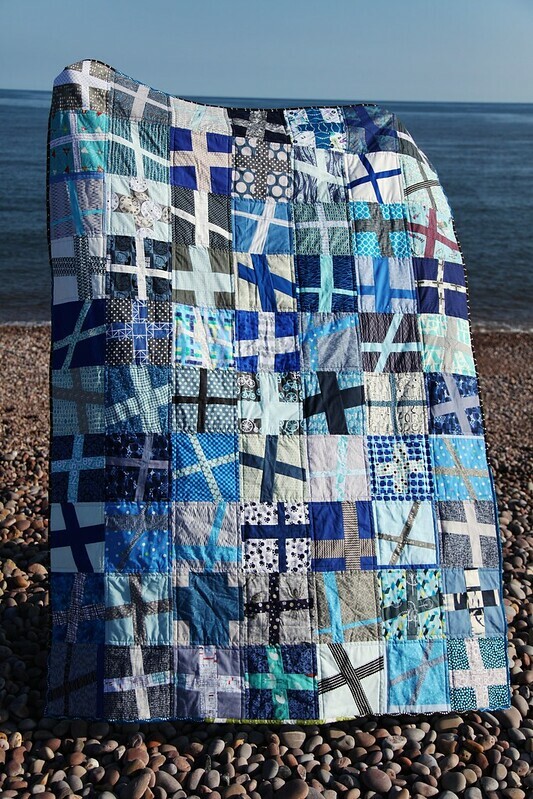 Wow, I've just spotted the quilt I made and it nearly brought a tear to my eye. Thanks to you and Lynne for all your hard work, both sewing and publicising this. I'll do my best to send at least one block this year. I'd be delighted to help out. I am planning to make a couple of quilts this year and I keep spreading the word. I will present this to my quilting group and Wi group. I make no promises but hope that other women will feel the same as I and want to take part. Thanks Mary, any contribution is great, please let me know if you have any questions. 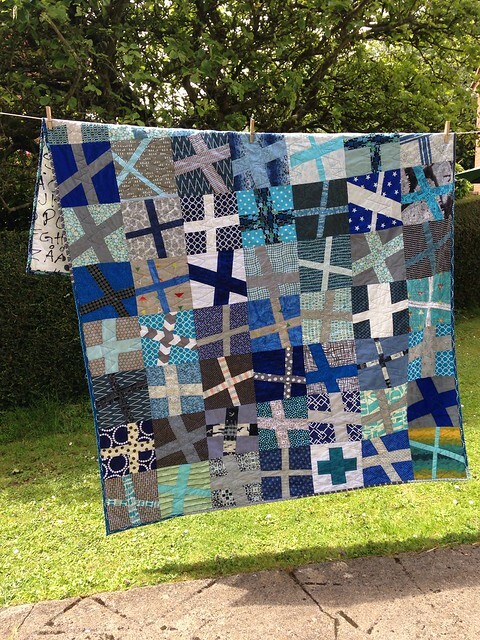 Mary I will definitely be making at least one quilt this spring and encouraging my other Edinburgh MQG members to do the same, one of them finished one just the other day. Keep up the good work, we are all behind you! I'm happy to donate but don't use flickr. Can you let me know where to send my quilt(s), please. It's a great, practical way to support such a worthwhile charity, doing something we love to do anyway. Thank you for all you do, Mary.